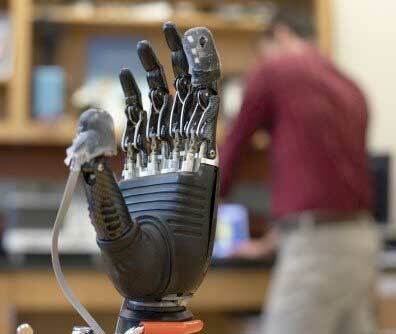 (Nanowerk News) Amputees often experience the sensation of a “phantom limb”—a feeling that a missing body part is still there. The work – published in the journal Science Robotics ("Prosthesis with neuromorphic multilayered e-dermis perceives touch and pain") – shows it is possible to restore a range of natural, touch-based feelings to amputees who use prosthetic limbs. The ability to detect pain could be useful, for instance, not only in prosthetic hands but also in lower limb prostheses, alerting the user to potential damage to the device. In a laboratory at Johns Hopkins, biomedical engineer Luke Osborn is giving a sense of touch and pain back to amputees. His solution, an electronic "skin" called an e-dermis, provides vital sensory information that could protect the prosthetic--and the wearer. In addition to the funding from [email protected], which fosters space-related collaboration across the university’s divisions, the team also received grants from the Applied Physics Laboratory Graduate Fellowship Program and the Neuroengineering Training Initiative through the National Institute of Biomedical Imaging and Bioengineering through the National Institutes of Health under grant T32EB003383.